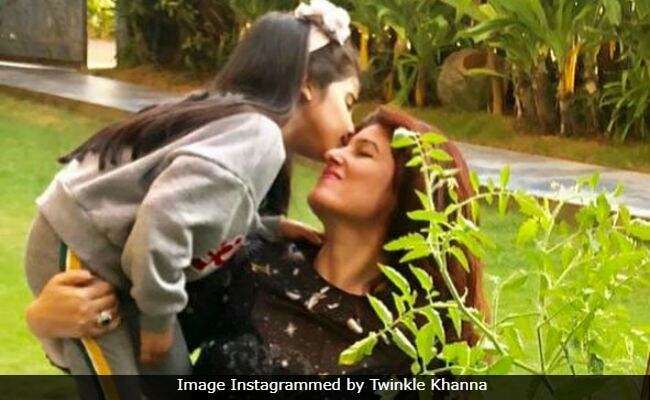 Twinkle Khanna is a doting mother and her latest Instagram reminds us of just that. On Monday, the 43-year-old author shared a post from her "mommy diaries" on her Instagram profile. Much to fan's dismay, Twinkle did not share a picture of herself with her kids but we bet it will make you smile. Mrs Funnybones shared a picture of treasure maps with her daughter Nitara's name printed on it. Twinkle captioned the post: "This is a called productive procrastination! Instead of getting on with work, I have spent a few hours fiddling with Photoshop and making a treasure map ostensibly for kids!" Twinkle added a dash of her signature humour to the post and wrote: "Hell no! It's just to make me happy." She added the hashtags "Treasure hunt" and "Mommydiaries." Twinkle Khanna frequently shares moments from her "mommy diaries" on social media. Last month, Twinkle shared a picture of herself with her daughter Nitara and wrote: "This is the only reason why mothers take on the arduous task of spending months and months looking like an elephant and feeling like a cow. #ALittleLoveGoesALongWay." Twinkle Khanna and Akshay Kumar met as young actors. They got married in 2001. Twinkle frequently addresses Aarav as a "prodigal son" in her posts. Remember the post, in which Twinkle forced Aarav to click her picture? "Forcing the prodigal son to take my pictures is an art. I have to keep reminding him that these are just small ways he can pay me back for carrying him inside my body for 9 months. The mother card," she wrote. Twinkle Khanna is a celebrated columnist and a film producer. She has written three books - Pyjamas Are Forgiving, The Legend Of Lakshmi Prasad and Mrs Funnybones - all of which were best-sellers.